Today is another day in the life post! You guys seem to enjoy these posts so I thought I would do another one! Yesterday, I spent the day at college like usual, but there's nothing exciting to talk about there! I have been experimenting a lot recently with my Too Faced palette and I have really been loving it. Trying out all the different shades has been amazing as I can what works well, its such a perfect palette for everyday use! There will be a blog post going up on Tuesday all about this wonderful palette, so keep an eye out for that! When I got home, I decided to spend some time catching up on YouTube and also getting ideas written down for my blog. I will go through phases of having loads of ideas come to me at once, and this was one of those days! I spent a while planning new posts for the future and writing about possible ideas which could work. I love thinking of new things that I can do and I love getting inspiration from other blogs too. At the minute I have really been enjoying In The Frow and also Kate La Vie. I have planned out my posts for the next few weeks so I hope everyone will enjoy them. I also really want to update the look of my blog. Now that I have got into it a lot more and stuck with it, I really want a big re-design! I have had a little look around at blog designers but I can't seem to find that many. If any of you know any amazing designers or if you are one yourself, then please let me know! Last night, I spent the night with mum which was lovely. I picked her up from work and we went to the shop to get some treats! Its just too difficult to eat healthy all the time...I decided to get small MilkyBar Easter egg as this was so much cheaper than everything else, so I thought, why not! It was really nice and I do love a lot of the chocolates that come out for Easter. We decided to watch Pitch Perfect as my mum had never seen it before and I insisted that she needed too. We both really enjoyed watching it and it will always be one of my favourites! My favourite part of the film is the scene with the riff off, I love it! I hope you enjoyed reading another day in the life post! I have some great posts lined up for the next few weeks...I will be back on Tuesday with another beauty post! I am currently working with an amazing brand called Dizen. Dizen launched in 2015 and brings you affordable fashion from a variety of brands! I have only just recently heard about this brand but I knew this would be a great brand to show you guys on my blog as I know everyone will love it too! Today's post is all about creating the perfect simple outfit. 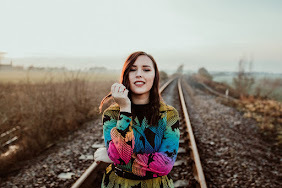 I have chosen a piece from Dizen as the main focus, and I am going to be giving you tips on how to create a quick and easy outfit, that still looks amazing! The lovely girls over at Dizen have also given me a discount code for all of my readers. Use the code 'KELLIENEE20' to get 20% off full price items! I would 100% recommend taking advantage of this as the quality of the clothes are really lovely and there's so much to choose from. This dress is from the Dizen website and is a high neck striped dress. It's black and grey and long sleeved as well! I decided to style this amazing dress with a simple leather jacket. I think that this pulls everything together perfectly and gives a statement to the outfit! I also decided to wear some amazing long black boots from Dorothy Perkins. I thought they matched really well with the leather jacket. Having the dress as the main feature always works well as you don't need to put too much effort in with the jacket and shoes. I decided to wear a Kate Moss lipstick in the shade 107. Wearing a bold lip is the perfect idea to include in a simple outfit as it adds the bit of colour which you need! It allows the red of the lips to stand out and this shade is perfect for the outfit. I also decided to include this heart necklace by a brand called Lvndr. Its the perfect necklace to add a bit of detail to your simple outfit. It works really well with the high neck and the colour's work perfectly too. You really don't need to spend a lot to create a stylish and simple outfit! A black and grey outfit with a bold lip is so easy to do and can be changed to everyone's taste. This dress by Dizen is really lovely quality and the perfect length for me. The high neck adds a really nice effect and works really well with the leather jacket. 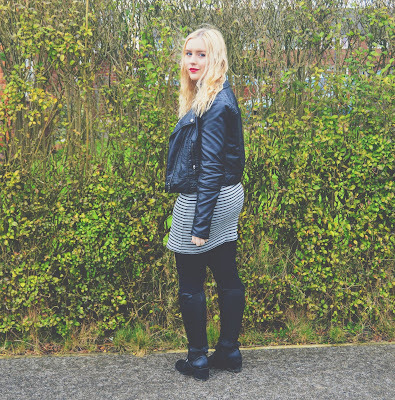 This leather jacket is from New Look so was really affordable and goes with so many outfits! Adding the long boots added the perfect finishing touch to the outfit and linked in well with everything else! I hope you enjoyed reading today's post and I hope I gave you some idea's on creating the perfect simple outfit. I always wear simple outfits as I think they are really quick and easy but can also look fashionable too. I tend to stick with black and grey as I love adding the colour with the makeup or jewellery! Today's post is another day in the life post and this is something that I had to include on my blog. On Wednesday night, one of my favourite TV shows started again for season 3! This amazing programme is called The 100. I have mentioned this a few times on my blog before because I love it so much! I have been looking forward to this season for months and months now so I was so excited on Wednesday! If you have never watched this before, you need too, as its unbelievable! I will also be showing you what I did on Thursday as well, as I had a really nice day spending time with my mum and my sister. Been able to watch The 100 again after so long was amazing! Season 3 returned on Wednesday night in the UK. Everyone in America has had it for weeks already, so I have been so excited to finally get to watch it for myself. I have always loved this programme and is 100% one of my favourties of all time. The first episode of season 3 was unbelievable. I was so tense throughout the whole thing and I loved seeing all the characters again. Season 3 doesn't carry straight on from the end of season 2, so it was exciting to see all the changes in the story-line and the characters too. This show has such an amazing and talented cast and the whole crew have made such a brilliant creation! I won't go into too much detail about the episode I watched, as I don't want to spoil anything for anyone. But please please please watch it if you haven't already, I guarantee that you will fall in love with it. On Thursday, I went shopping with my mum to White Rose. I went intending to buy a new eye primer, but came out with a lot more than expected. So, I thought that I would share with you all the things that I picked up in Boots and Superdrug. The first brand that I am going to mention is Barry M. They had an offer on in Boots, so I picked up 4 new products. The Flawless Colour Correction Primer and the Flawless Matte Finish Foundation were the first two things. I want to try out new drugstore foundations till I find one that I really love, so I thought this would be a good place to start. I picked up the primer to go with it, as the description sounded perfect for me! The next two products were; the Brow Kit (Light to Medium) and the Mini Mask. I have always used the same product for my brows and I have heard a lot about the Barry M kit, so I thought I would buy it and give it a go! In Zoella's recent haul video, she purchased the Barry M Mini Mask which is a treatment for your nails, and this is something that I needed at the minute. The second brand is L'Oreal, they had a 3 for 2 offer on, so I picked up 3 new things to try out! The first is the Infallible Fixing Mist. This is something that I have wanted to try for a while as it states that it sets and extends make-up! The second product is a blush in the shade 145 Rosewood. I never usually buy a lot of new blushers, but this was a really pretty shade that I wanted to try out. The final product from L'Oreal is a lipstick. This one is part of the collection exclusive range, and this one is Eva's shade (Delicate Rose). I love the packaging for this lipstick and can't wait to try it out! I also picked up my current eyebrow product from Rimmel. I use the Professional Eyebrow Pencil in the shade 002 Hazel. I have always used this product so I am keen to try out some new ones! Collection have recently brought out some new products, and I specifically wanted to buy an eye primer. They have just released the Primed & Ready Eye Primer, so I thought I would pick this one up. The texture is really smooth and the packaging is lovely too! Lucy and Lydia are two twins who run a YouTube channel. I have spoke about them before on my blog as I love them! They have spoke about the brand Miss Sporty quite a lot and one product in particular, So Matte Perfect Stay Powder. This brand is so affordable, so I thought I would give it a go, as I love recommending drugstore makeup to you! Finally, I bought two new hair products from Superdrug. VO5 had an offer on which was 2 for £5, so I wanted to try some of their products. I chose the dry texturising spray and the dry backcombing spray. My hair is always really straight and struggles to gain any volume at all! So, I wanted to try out these products to face the problems that I have with my hair. I may do some reviews on these products on my blog in the future, and I will be sure to let you know of any favourites that I thought were amazing! I haven't had a big splurge on makeup in a while, so it felt really nice to treat myself for once! I can't wait to try out these products and I hope they all live up to expectations. Later that day, I went out for tea with my mum and my sister. It had been a while since all three of us got to spend some time with each other, so it was really nice. We had a lovely meal and had a well needed catch up! I ended the day, by getting into bed and catching up on my YouTube videos. This is honestly one of my favourite things to do! On Thursday, I caught up on The SacconeJolys in particular, as their videos make me so so happy! There are so many YouTubers that I am loving at the minute, and I'm sure I will do a blog post about it in the future! I hope you enjoyed reading this blog post, I really enjoy writing the day in the life posts. I will be back on Tuesday with another beauty post. I hope you're all having an amazing week so far, and I hope you're relaxing over the weekend too! This is probably one of the best dresses of the night! Ellie Goulding is one of my favourite artists and she looked amazing! Her dress was really simple but looked beautiful. Her hair and makeup were amazing and would be exactly what I would want if I attended the Grammy's! Selena Gomez never fails to impress with her fashion choices! This dress is the perfect colour and the sparkles add a really nice effect! She looks amazing as always and is defiantly someone that I consider an idol. Kaley Cuoco looked stunning at the Grammy's! The simple play-suit looked really classy and showed off her amazing figure. Her hair and makeup are what stood out to me the most and overall, she looked gorgeous! Anna Kendrick has always worn very simple outfits and dresses, which is what I love! You can never go wrong with a black dress and I really loved her choice! I thought that she looked really classy and stunning as always. Demi Lovato is another one of my favourites as I love how everything matches! I really love her with long black hair and her makeup looked gorgeous too. The black outfit looked perfect on her and I love the accessories too as it adds a really pretty effect. Carrie Underwood is someone that I have never really noticed before but her dress really stood out to me when looking through all of the red carpet photos. As you know, I love black dresses and this one was really beautiful! The style is perfect and I love all of the smaller details too. Yesterday I spent the day with mum as we haven't had time together in a while! I'm really close with my mum so I really enjoy spending time with her and going on days out together. We decided to go shopping to Doncaster as this is something that we usually do and I really wanted to buy some new things as it has just been pay day! Yesterday's outfit consisted of all black, as usual! I wore my black dress, black long boots and my leather jacket. I have also recently got a new necklace from a website called Lvndr. I first heard of this website on YouTube and I thought all of the products looked amazing, so I thought I would have a look for myself. I have been wanting a necklace like this for a while now so when I saw it on the website, I instantly fell in love! The necklace is a crystal heart necklace with a gold chain. Its really pretty and I definitely want to buy some more pieces from there soon. It got delivered really fast and came in really cute packaging too! I didn't really buy anything yesterday as there didn't seem to be much that I liked. The one that that I did decide to buy was the sculpting brush which is part of the Real Techniques Bold Metals range. I have wanted these brushes for so long and they were on offer at Boots, so I decided to pick one up to start off my collection. The rose gold is really pretty and the brush is so soft and fluffy. When I got home, I decided to order a new makeup product online that I have wanted for so long, and since I didn't really buy anything in Doncaster, I thought that I should treat myself! I decided to order the Too Faced Chocolate Bar Palette! It hasn't arrived yet but I'm sure I will be doing a review of the product on my blog very soon! Later on, I decided to go the the gym as I usually do, and I am really happy that I made myself go after eating all of the food at lunch! Me and my family then got together as it was 4 years since my Nana had passed away. My Nana was a massive part of all our lives and I miss her more and more each day. I love spending time with my family as they are so important to me and they all do so much for me.